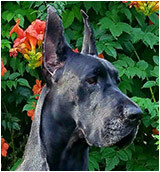 Tru also works as a therapy dog at the Louisville Senior Center, Avista Adventist Hospital and Good Samaritan Hospital. Good dog Tru! Mary Ethel Ball, who became Dean of Women at CU, lived in this house with her parents, Harry and Nettie. Built in 1909, the wood framed structure rests on a stone foundation. Happy Birthday Waterloo on your 9 rockin’ years in Louisville. Come in and celebrate Waterloo’s 9th birthday with a $9 all-day menu and free birthday cake! Unlimited Tastes & Souvenir Pint Glass! 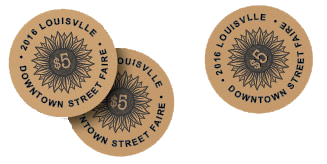 Remember your Street Faire drink tokens, you know the ones you found in the wash, are good at these establishments thru December. 12 Degree Brewing, 820 Main St. Bittersweet Cafe & Confections, 836 Main St.
Coopers Corner, 940 Main St. Empire Lounge and Restaurant, 816 Main St.
Eric Olson Master Jeweler, 950 Spruce St.
Front Street Hair Studio, 734 Front St. 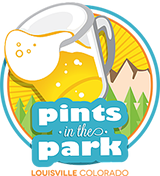 Gravity Brewing, 1150 Pine St.
La Revolucion Taqueria y Cantina, 701 Main St.
Little Horse 1, 2, and 3, 820 Main St.
Madera Grill, 817 Main St.
Nina’s Flowers and Gifts, 906 Main St.
Old Friends, 706 Front St.
Pica’s Mexican Taqueria, 901 Front St.
Por Wine House, 836 1/2 Main St. The Book Cellar, 724 Main St. 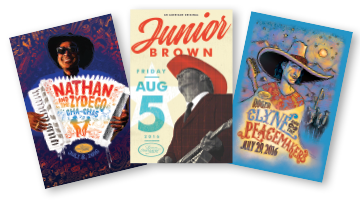 The Singing Cook, 728 Main St.
Zucca Italian Ristorante, 808 Main St.
We have a few Roger Clyne, Junior Brown and Nathan and Zydeco Cha Cha’s available at Old Friends and The Singing Cook. They are, as always, free, but one per customer please. Good idea to phone first. Creative Framing is celebrating their 21st year in Louisville with an amazing Art Show featuring the return of abstract impressionist Joel “Emeka Dragonfly” Cook, and for the first time in the Gallery, Leslie Jorgensen, Leslie Brown and Christopher Brown. All three are dynamic imaginative and dramatic artists. In addition, artists-in-residence will present updated collection of sculpture, glass art and jewelry. Live music and good eats too. The show runs through October. 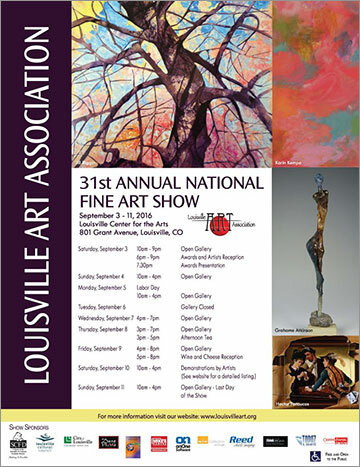 The 31st National Fine Art Show features talented artists from all over the country and is a community favorite year after year. 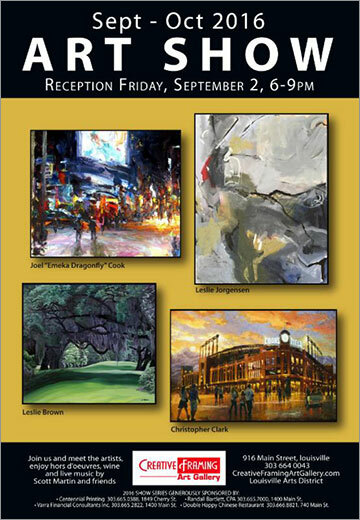 Wine and cheese reception on September 9 and demonstrations by the artists on September 10. More information at louisvilleart.org. The kids are back in school, the summer nights are lingering just a little longer, babies are growing and Mama needs a night off! Swoon is setting up shop at the incredible Por Wine House for one last summer night. Come down and enjoy a glass of wine, add a little sparkle to your jewelry collection and be in community. Kids are welcome but remember mama needs a little time for her when possible! Don’t forget to invite your girlfriends! Like yoga? Like great craft beer? Then you’ll love Poses and Pints! Join Martha for some local brew and local laughs at Liquid Mechanics! Loosen your body and relax your mind with a 60-minute all levels yoga class, and afterwards enjoy a pint of your choice. Class plus tasting (or pint) is $15. Please bring cash or a check to Liquid Mechanics, or sign up in advance and pay with a credit card at Yoga Junction or online at LouisvilleYogaJunction.com. The Gravity Team invites you to celebrate another successful year, thanks to their loyal customers and friends! Beginning at 1pm they will be tapping special barrel aged and small batch beers every hour in addition to their regular lineup. There will be live music from the legendary Jazz Ram followed by local favorites Full Belly! Gastronauts at Gravity Brewing will be cooking up some awesome food! Don’t miss this party! 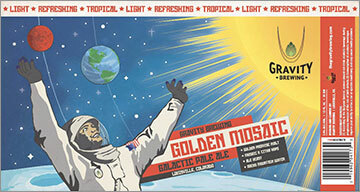 Gravity is also celebrating the release of their first canned beer, Golden Mosaic. Have you registered yet to win the Best Pie in Boulder County! Registration forms are available at The Huckleberry. Pre-registration is recommended. The categories are Apple, Fruit and Nut and Cream pies. 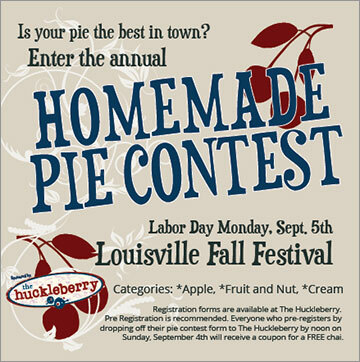 Grand prize is dinner for 4 at the Huckleberry, a photo at The Huckleberry’s Pie Hall of Fame and a champion pie plate. First prize for each category is tea for two at the Huck and a Fall Festival pie contest apron. September 29, 7:00 pm; Louisville Center for the Arts. Sponsored by the Louisville Cultural Council. Participate in a community discussion on parenting in our turbulent times and how to prepare our children for the challenges ahead. Presented by Boulder Psychological Services. Another in the series of programs based on the theme of Louisville’s Larder, which features agriculture, restaurants, the history of Italian influence on the local food culture, and a look at a typical family’s kitchen, garden, and larder. This month, Louisville’s 7th Generation Farm will be featured. Ed Helmstead, a Louisville resident and professional sign painter, is responsible for painting many of the commercial signs that we see in downtown Louisville today. Museum Coordinator Bridget Bacon will interview Ed about his interesting career and show images of some of the Louisville signs that he painted. These include those that he painted on the Historical Museum and the State Mercantile Building. Bring your questions to ask Ed! 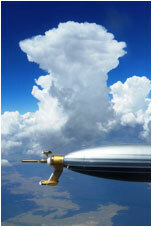 Explore the science of clouds, light polarization in the sky, and the pressure on the Earth, from space to the ocean. There will be demonstrations and hands-on activities for participants.Come as a family. Appropriate for ages 5 and above. Space is limited, so please make a reservation. Presented by Dr. Sarah Woods and Dr. Colin Gurganus, Atmospheric Research Scientists at SPEC in Boulder.